The mooring at Washingborough is to be recommended for an overnight stay. Very quiet and peaceful. Mind you the tap tap on the window makes you aware of the life outside. Moving on towards Bardney at a leisurely pace one gets the chance to enjoy the scenery. 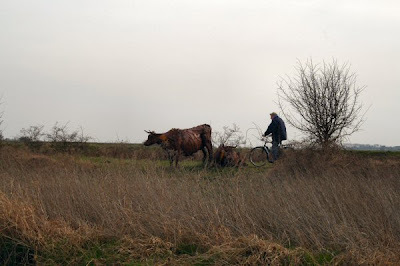 Shortly a pair of cows come into view. Not real ones but one in a series of sculptures created for the Water Rail Way – the path to Boston. A rather good representation of the animals I must say. A little further on there is what seems to be a series of humps. Whether or not this represents the Withern Monster along the lines of the one in Loch Ness I know not but I bet the children enjoy playing on it. From that point on one spends the time wondering what will be seen next. A pleasant occupation. Looking like an arch, from the angle I was at, some 15 foot high wheat made of steel broke the flatness of the surrounding. The presence of the sculptures does make an interesting addition to the trip. The first view of Bardney is on the right but it is the silos of the old Sugar Beet Factory that stand out for miles around. At 11 km, Fiskerton, there is a foot bridge. I am not sure if it is possible to moor here but there are two likely spots, one on each bank, under the bridge. 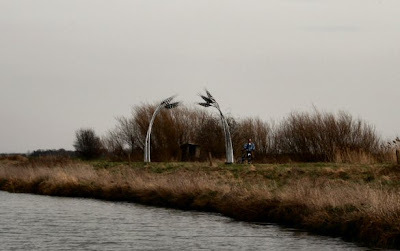 A couple more kilometres and Fiskerton Fen visitor moorings. These as like many others along here are 72 hours only. 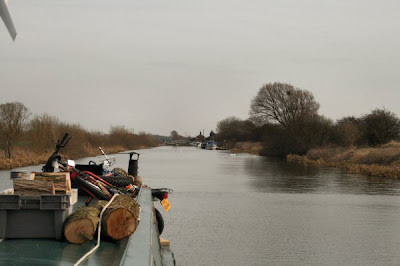 A long straight and at 13 km more visitor moorings just before Bardney Lock. I moored up here for the night. Well the batteries are charged and there is no hurry. A chat with a lady that lives on a winter mooring here threw up some interesting items. It was told to me that there are a number of mink running amok around the pontoons. 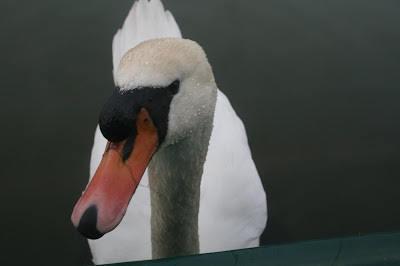 One was seen wandering down the pontoon and climbed aboard one of the GRP boats by slipping under the canvas. She had already had some problems with mink when one found its way into the bow having chewed its way through the canvas then chewed through every plastic sack on board ruining potatoes etc. there are a number of holes to be seen on the bank which is where they live I was told. I must apologise to Naughty Cal who passed me in Lincoln while I was tying up to retrieve the fender for not saying hello. I am not really bad mannered and thanks for the email.